Oops! Somebody goofed. Happens all the time. Figure 1: The circuit traces for connectors on the left side should route to the connectors on the right side. Simple mistakes are magnified on complex, expensive assemblies. A routing miscommunication resulted in a significant problem for a customer. Figure 1 shows how the assembly was actually manufactured. The circuit traces for connectors on the left side were supposed to route to the connectors on the right side. Unfortunately the opposite was true. If the circuit board connectors were not rewired and the mating daughter board was plugged in as pictured above, sparks would fly! Do to time considerations re-manufacture was not viable option. Figure 2 shows how the mating connectors should have worked. Figure 2: Original daughter card configuration. There were a few options considered. One option was to manufacture a custom adapter card that included the rewired circuit traces. The conductors could have been mounted to the adapter card and the card could have been soldered to the main circuit board similar to a leadless chip carrier. The adapter card option would have involved significant engineering work and the time constraint simply would not permit it. The only option meeting the time constraint was good old fashioned jumper wire rework. In this case the rework involved four 64 pin connectors requiring 256 wires. That's a lot of wires in a very tight space. Figure 3. initial wiring begins. How to get all these wires in the proper spot without shorting them or connecting them to the wrong pads or connector pins? Well, let's break it down and see how it was done. We used the smallest diameter wire to accommodate the tight spacing. A few wires needed to be a larger gauge for power needs, but the bulk of the wires used were 34 gauge. Figures 3 provides a good view of the mass of wires being put in place. First wires were soldered to all the pads on the circuit board surface. Then thin sections of laminate material the size of the connector were cut and the connectors were bonded to these laminate sections. 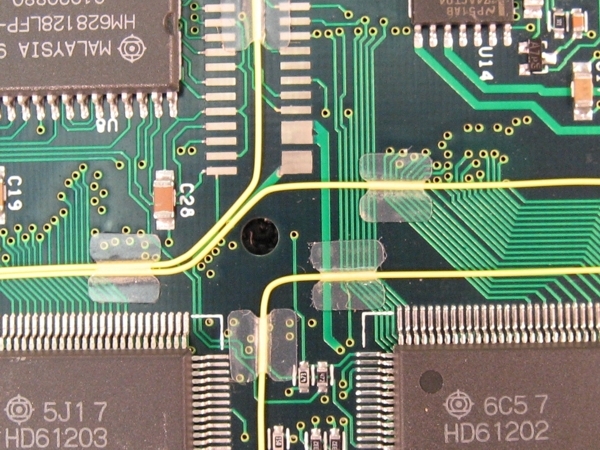 Then these connector and laminate assemblies were bonded directly over the recently solder jumper wires. It was important to ensure the connectors were in perfect alignment with the mating daughter card when the wiring was complete. Figure 4. Wiring completed and connectors mounted and bonded in place. Next the technician began the process of wiring the pads to the proper connector. Each side of each connector's wiring was inspected as it was completed. Figures 4 shows the connectors wired to the board.